Meramec Caverns is the largest cave in Missouri that conducts guided tours by trained rangers. Located in Stanton, Missouri in the LaJolla Natural Park, the Caverns is rich in history as well as beauty. The cave was discovered by a miner looking for gold in the 18th century, but he found saltpeter instead, a mineral used in the manufacture of gunpowder. That led to the cave being used during the Civil War as a gun powder mill by the Union. 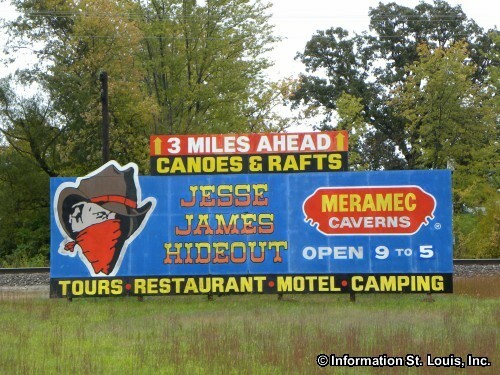 Jesse James also used the caverns on a number of occasions as a hideout in the early 1870's. 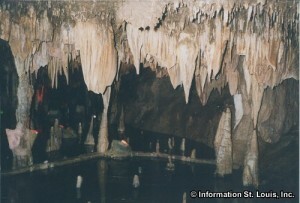 Meramec Caverns has been a sightseers delight since 1933 when it was first opened to the public. Travelers on Route 66 did not have a hard time finding it because the owner, Lester B. Dill, used a unique way of advertising. Along Route 66 he would make an offer to farmers whose barns were in need of a paint job. His offer was that he would paint the barn if the farmer would also allowed him to paint the roof with an advertisement directing travelers to come to his Meramec Caverns. He was also the inventor of the bumper sticker and anyone who visited his Caverns got a bumper sticker. Those bumper stickers promoted Meramec Caverns all across America. Today concrete paved trails allow visitors to explore 1 1/4 miles of the cavern and the spectacular formations made by thousand of years of water and mineral deposits. The Stage Curtain, America's number one cave scene, is an extraordinary mineral deposit which measures 70 feet high, 60 feet wide and 35 feet thick and is the backdrop to a light and music show given during the cave tour. Admission is charged. A restaurant is located in the Cavern and a motel is located in the park. Canoeing, camping and riverboat rides are also available.